Herbert Allen Giles (8 December 1845 - 13 February 1935) was a British linguist who modified a Mandarin Chinese Romanization system established by Thomas Wade earlier, resulting in the Wade-Giles Chinese transliteration system. 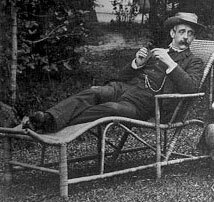 Giles was a diplomat to China (1867 – 1892) as British Consul at Ningpo who later became the second professor of Chinese at Cambridge, succeeding Sir Thomas Wade, after living in Aberdeen, Scotland. He spent a brief time at Fort Santo Domingo (1885-1888) in Tamsui, Taiwan. He was the father of the sinologist Lionel Giles. English translation of 164 stories (out of 431) from Pu Songling's collection of ghost and fantastic folk tales, Liaozhai Zhiyi. Adversaria Sinica - From 1904 to 1915, the Shanghai publisher Kelley and Walsh published a series of Giles' scholarly papers, reviews, etc. Postal map spelling is also based on the Wade-Giles system described in A Chinese-English Dictionary.